I’m sure there’s a joke here somewhere…. Here’s something you don’t see everyday: I had to buy some printer ink in Lincoln today, and got to visit two geese that were hanging out in the parking lot of Office Depot. 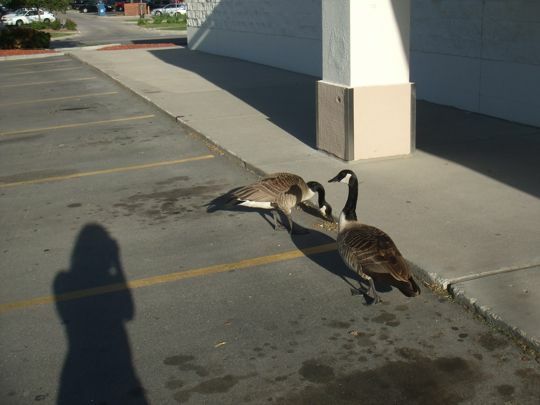 Two geese walked into an office supply store…..
And yes, they will bite if you try to pet them! A goose walks into a bar and says to the bar tender “I’ll have a beer”. The goose says “I’m working the construction site across the street”. Hey, I made up my own joke…well, it’s supposed to be a joke…maybe it’s a noke. It’s a good one, Peggy!